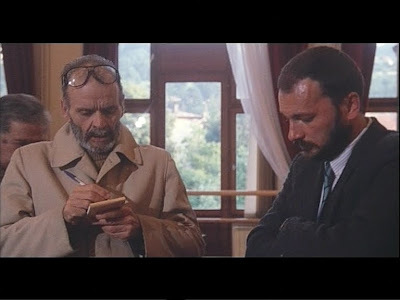 Despite being listed as such by several sources, most notably DVDCompare (see listing here), the Italian Minerva Pictures/UniVideo "HorrorClub" DVD of Lucio Fulci's Aenigma does not feature an anamorphic transfer. DVDCompare notes a stripped down "DeAgostini" release without an anamorphic transfer and in only Italian audio. The release I recently picked up definitely has Italian, English, and French tracks along with a Fulci bio, trailer, and gallery. Although it's definitely not a 16x9 transfer, just 1.85:1 widescreen, after popping the disc with my DVD-ROM and standalone player. The specs on the back cover are slightly confusing stating "Letterboxed: 16:9"--which is a contradiction. The term "letterbox"usually refers to a DVD being non-anamorphic. Maybe that's confusing people into believing this release is enhanced for widescreen displays.